An image of a sleeping soldier is to ‘guard’ Exeter Cathedral from dusk til dawn the night before the centenary of the Armistice. The sleeping soldier artwork will be projected onto the North Tower of the Cathedral and is an Arts Council funded installation by Exeter artist Leo Jamelli. 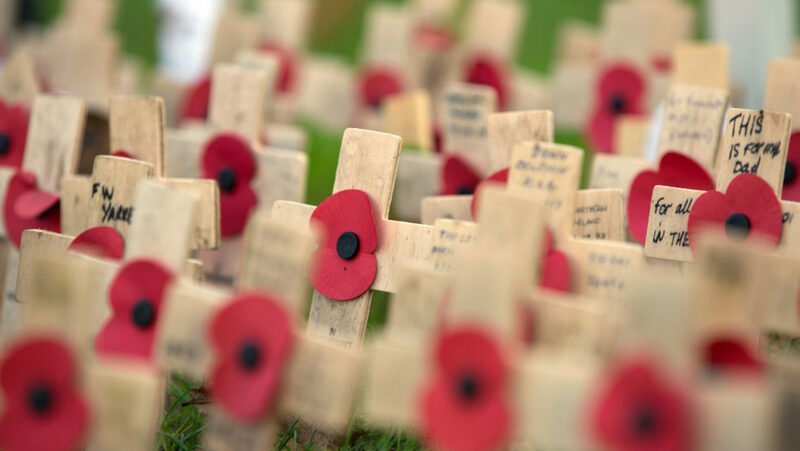 Remembrance season will be marked with drama and music as well as art at the Cathedral next month. Retired major general Andy Salmon OBE, the last British general in Basra, Iraq and a former chorister, is bringing his unique fusion of stories from veterans with art and music arranged for injured service personnel following the First World War to the Cathedral for one night only. Together with one handed concert pianist Nicholas McCarthy, his production weaves together art, poetry and stories of conflict, injury and rehabilitation from the experiences of servicemen and women in conflicts from WW1 through to WW2, from the Troubles up to recent campaigns, including Iraq and Afghanistan. The production Journey through conflict: from then until now is available for just one night on 9 November. Also performing in the Cathedral is the award winning theatre company Antic Disposition, who are putting on three very special Remembrance themed performances of Shakespeare’s Henry V, in which the setting moves between 1415 and 1915. The Cathedral is also putting on its own series of talks examining the ethics of armed conflict, reconciliation and remembrance. Speakers include the Cathedral’s own Canon Treasurer, Dr Mike Williams, a former Royal Marine, and Dr Georgina Byrne, canon of Worcester Cathedral and a chaplain to the Queen. As you’d expect, music will play a focal role in Remembrance services and commemorations at Exeter Cathedral: with the Royal British Legion Festival of Remembrance with the Band of the Royal Marines, the dedication of the Field of Remembrance on Cathedral Green, and three Remembrance Services on Sunday 11 November itself.